Our higher selves are guiding us along our paths, nudging us to find and connect with our spiritual centers. Within our spiritual centers we are able to work though issues to help heal ourselves. Once we resolve, understand, accept and heal from any issues which crop up along our paths, it frees us from barriers we have either knowingly or unknowingly created around ourselves. Removing these restrictions brings personal growth and transformation, and ultimately freedom. You have the power and freedom of choice, so your physical path may and can change, yet your spiritual one towards healing and growth will be the same lessons you are meant to learn. Others may bring you the lessons you need for your soul growth and transformation, if you are open and willing to change whether you modify your physical path or not. Or perhaps making that change was part of your journey towards a life lesson. Spirit will keep providing us opportunities for what we contracted to learn before manifesting in human form in this lifetime. The lessons will start as a nudge, and if we don’t learn, the lessons are a push, and if we are still choosing not to learn, we can experience a forceful shove, sometimes over the cliff. Some may call this forceful shove hitting rock bottom. In my life, I have recognized many lessons, sometimes after the big shove. Great growth is available to us from our deepest pains, and sometimes it’s the only way we can learn as we are not focusing on ourselves. One of the lessons I learned from the big shove was relationships and trust, but most importantly, loving myself enough to not choose someone who was unavailable in some fashion. Many of my relationships were with boys and men who were not on a healing path and it caused me heartbreak. I kept repeating this pattern until I had the huge Aha moment. Now I have a lovely, open and compassionate man in my life and I’m eternally grateful for the choices I made, even though I worked through nudges to the big shove. It was well worth it, yet, now I find myself more open to understanding when the lessons are coming and can act on the nudges. My spiritual path is still leading towards breaking me free from any barriers I’ve created for the lessons I’m meant to learn for my highest growth & transformation. And as long as we are alive, more lessons will come. The more we learn, grow & transform, the more wisdom we gain. And, the more wisdom we gain, the more harmony, love & peace we have within us, knowing we have the power within us to withstand any challenge. Look around at those in your life and where you are in your life. What do these people have in common? How do you feel? Where might you rather be? The more we ask questions such as these, the better equipped we are to learn the lessons as they initially present themselves. It also makes us better prepared for the next lesson, ultimately leading us towards connecting more and more with our higher selves…our spiritual center. 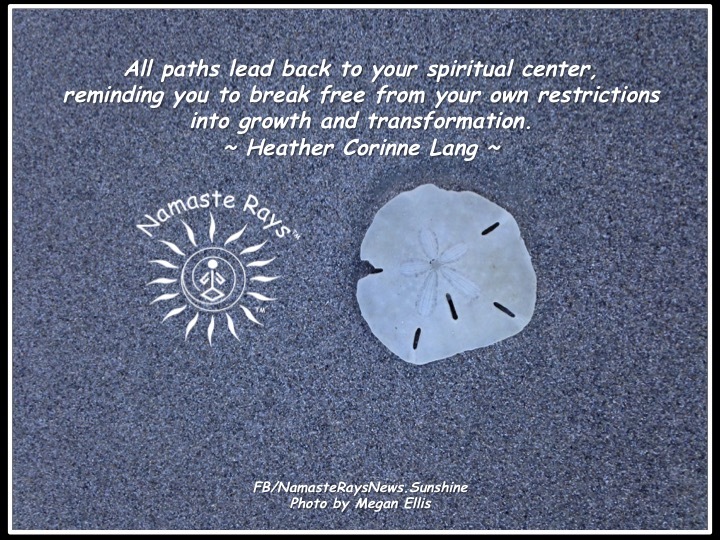 May you continue on your spiritual path to growth & transformation! Please feel free to contact me to learn how I may help you on your spiritual path. Heather, thank you for sharing your lessons learned. My pleasure, Celia! Thank you for your thoughts! Namaste!